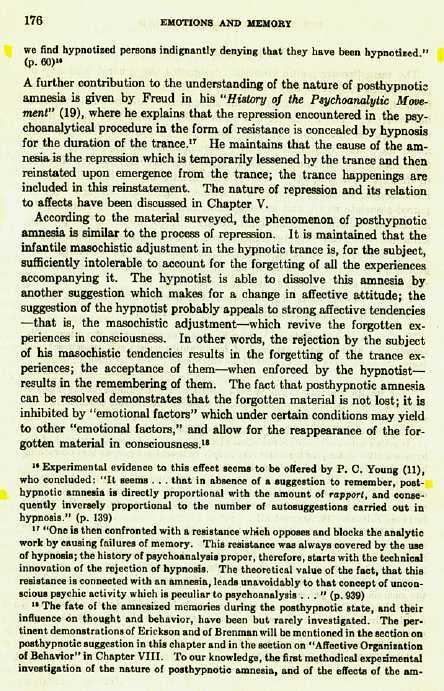 Further compilation and consideration of page 175 by inference of note 16, page 176 derived from the referred experimental evidence, alternatively states that somnambulistic performance will naturally create amnesia and that fewer suggestions post hypnotically acted on will be easier to forget. The note beginning on page 175 that continues to the top of page 176 exemplifies and defines a profound or extreme potential of memory performance as a natural tendency of hypnosis. An enhancement to the argument presented here is that; if the general tendency is to forget and a phylogenic motivated disassociation or repressed parental complex is used to motivate the creation of post hypnotic amnesia conditioned by exploitation of affective tendencies and their meanings in the commission of hypnotic manipulation; then the uses of suggestion to visceral fear as a motive to empower suggestion to forget, coupled, with the work of the hypnotist to "dissolve" amnesia, implies that barriers to memory can be "built." If barriers can be built they can be destroyed although trauma from childhood somnambulistic trance states may often prohibit recall. See CHILDREN UNDER FIVE. At the end is a note concerning the fact that some individuals become addicted to occupying alternative trance states other than the normal waking state recognized as conscious. This is particuarly important to integrate into the understanding of the potentials of abuse that is the primary purpose of this site.